Tina's Crop Shop: GIU Post #5 Love Brings You Home! Love the card, my son and family brought us a beautiful gift from God also, she is from China and came home to be our family. I have a 3 wonderful grandchildren and one is our China doll. love the first card...thanx for still sharing, eventhough the stamp is retired...those who have it can replicate....and those who don't can use a similar stamp...and the second card just made me adjust my wish list...been a great week! The doilies are lovely- they work beautifully for the emboss resist! And I’ll have to look up that 2nd set. I’ve missed that one somehow. Great cards. Lovely doily card even if it doesn't count! I like the embossing on kraft on the second. Both cards are lovely and inspire. Great job. Love them! I love the choice of green! I also have been eyeing this kit, so it might wind up in my next cart! OMGosh, I love BOTH of the cards. That green is amazing. I have it unopened on my shelf, I am thinking I need to open it and play with it now. The sentiment on the green card is lovely, I love Robin Williams. Both cards are well done! The doilies are just beautiful! 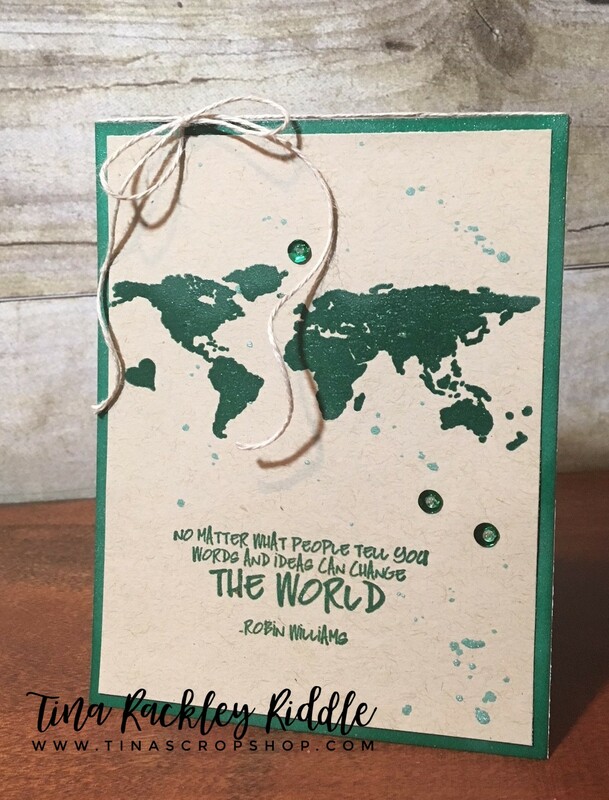 And the world card is so compelling in the green! Beautiful cards. I think I need those stamp sets. Thank you For a great week of inspiration! Gorgeous cards! Love those beautiful doilies. Maybe Unity will bring them back... You sound like me, over thinking my design. lol hanks for a fun week of inspiration. Thanks for a wonderful week,I really had an inspirable,fascinante,interesting time.Both cards are fabulous. Happy New Year!!! Like the simplicity of the card. 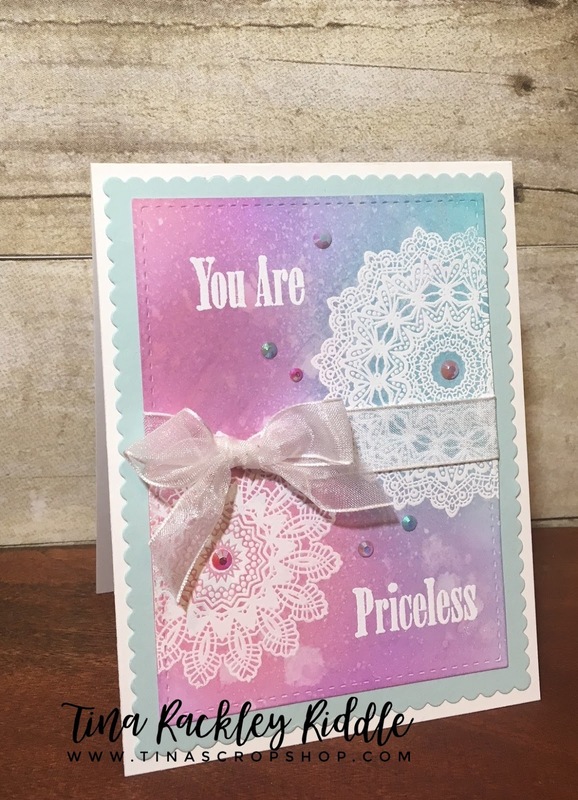 Bohemian Backgrounds has a similar doily which would work as well for the first card. It is still cute and I love the green monochromatic style of the second card. Two beautiful cards! Love the colors on the doily card! great cards !!! thank you for sharing your talent with us this week. I enjoyed your creations. Both are really pretty cards! Love the map, again Unity has a stamp for everything. I never thought to VersaMark over something I stamped. Excellent idea I’m going to try it. The first one is Gorgeous!! The second one is amazing! I think it's my favorite ..no, the first one is.. ugh...it would be easier if there were a coffee cup on them! ;) ~WinkWink~ Loved your week, Tina!!! TFS!! I love both cards! I have never noticed the set for the second card. I love the image and the words! Love that emerald color. Your cards are beautiful! Love them both! Again your detailed instructions are awesome 💕 hope you have a wonderful new year! Both cards are wonderful! Both stamp sets are new to me. I'll have to look the world map one up, I like it a lot! Thanks for all you did being a GIU Girl! It was a great week! Beautiful cards! The green is striking and I love the colors on the Doily card. Wow. I love the sentiment and the green you chose for the map. I’ve never noticed that set. I’ll have to add it to my wish list. You e done an awesome job being a GIU. And I am going to get that sentiment as well! Thanks for sharing! Sometimes the most beautiful comes from the most simple. I love, love, love this world card. I've always loved Robin Williams' tragic wisdom. The other card is beautiful too, but selfishly, I'm kind of glad that set was retired. I haven't seen the world one used before. You saved the best for last! Both cards are beautiful! I love the love that went into making the world card. These are two great cards ! But my heart goes to the first because of the gorgeous colors !